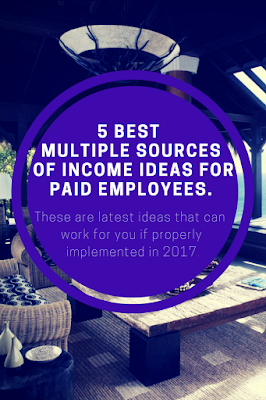 5 Best Multiple sources of income ideas for Paid Employees. With the current economic situation in the country, a lot of people in paid employments are now understanding the fact that having only one job is not just enough. Most of them are now looking for multiple sources of income ideas so as to improve their financial security or to just supplement the current stream by making extra income from other sources. Even though you are not being limited to these passive income ideas, i will give 5 multiple sources of income ideas in this blog post. These are latest ideas that can work for you if properly implemented in 2017. This is the most simplest and easiest passive income idea and you don’t need much capital to start. You need just microsoft world to start writing the ebook. It doesn’t have to be 500 pages. from 20 to 50 pages is enough. The tittle of your ebook should be able to capture the interest of your target audience and make sure your ebook can solve certain problems for the group of people it’s meant for. In your spare time, you can just pen down some ideas you can use to form the chapters of the book and later expand on it to for the full chapters. You can write 3 to 5 pages daily and within one week to 2 weeks you should be able to launch your first ebook. After writing your book in microsoft world, you will need to proof read it to be sure it’s free of errors and spelling mistakes. Then you format the book and publish as pdf. Once this is done correctly, you can setup a simple website to sell the book and promote on social media websites and others. Since this is your intellectual property, you set the price for your ebook from $10 to $20 or even more and once you make a sale, you keep all the profit. 2. Real Estate Rental Business. especially for those that have cash that can be used to build or have access to loan facility. Building houses and renting out to long-term tenants can be a good passive income source. You can manage the collection of rent yourself or engage the services of real estate agent and give them certain percentage of the rent for their services. 3. Become a Business Silent Partner. This is a strategic way to earn passive income for paid employee that have some cash in the bank. There are a lot of business owners, contractors, suppliers etc that have good and viable businesses already and what they need is just some instant cash to further push the business and earn their profits. So what you will do is instead of borrowing them the money, you will have to make and agreement with them to be sharing profit with them for investing in their business. 4. Create an Online Store with Drop Shipping. This is also an easy way to earn passive income for paid employees. All you have to do is set up a website where you can sell product from a certain manufacturer. when customers visit your website and orders the products, you quickly direct the order to the manufacturer who will then ship the products to the customer and you earn your profit. 5. Buy an existing Online Business. Buying an existing online business is a good idea and a real source of passive income for a salary earner. Starting a business from scratch will require a lot of time and capital. but buying into already established online business can be a smart move. Buying into company such as coolnaira requires less capital. you can start with as little as N1,000 and as much as N10,000 and continue to earn passive income form it on a daily basis. Previous Post Previous Post: 10 Ways To Make Extra Income while Working Full time in Nigeria.